Svalbard was first sighted in 1194. William Barents and Jacob van Heemskerck reached the island group in 1596. In 1920 the islands were awarded to Norway by the League of Nations. Rights to deposits of copper, iron, phosphate, zinc, and coal werre to be shared between Denmark, Italy, Japan, the Netherlands, Norway, Sweden, the United Kingdom, the United States, and, since 1925, the USSR, now Russia. The total land area of the dependency is 23,957 square miles, with a population of approximaely 4,000. Svalbard lies some 400 miles north of Norway and is composed of five major islands and many small ones. 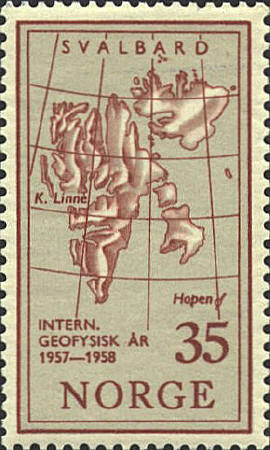 The stamp was issued as a set of two to commemorate the International Geophysical Year in 1957. Fridtjof Nansen was born at Store Frøen, near Oslo Norway in 1861, and died in 1930. He was the zoological curator at the Bergan and Oslo zoos, the first person to explore the interior of Greenland, the leader of an expedition that reached 86°14' N, and the League of Nations' first High Commisioner for Refugees. The latter two accomplishments are commemorated on the Armenian stamp. 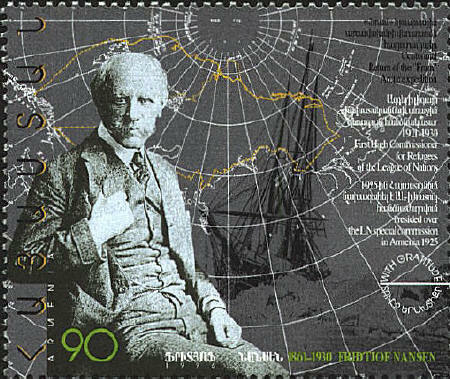 Nansen's expedition in (1895-1896) to the North Pole was unusual in that he depended on the drift of the ice from the New Siberian Islands, north of Siberia, to the Atlantic Ocean. The Fram was specially constructed to resist the pressure of the polar ice. The expedition took three years. Nansen and Hjalmar Johansen attempted to reach the Pole by dogsled, but did not quite make it. They reached Franz-Josef Land where they spent a year before they reached Norway. The route of the Fram drifting in the ice is shown on the stamp. Elisha Kane, a naval surgeon, led two expeditions to locate Sir John Franklin, a British explorer who was lost near Greenland. In 1852 Kane brought his ship, Advance, into the channel between Ellesmere Island and northwest Greenland. Though they did not find Franklin they brought back knowledge of the Arctic for those who would come later. In 1882 Greely reached further north than anyone had before him. They recorded tidal and meteorological data. Their relief and supply ships failed to arrive, and Greely's team had to walk out. It took two years, and when they were rescued only seven of the original 26 were alive. 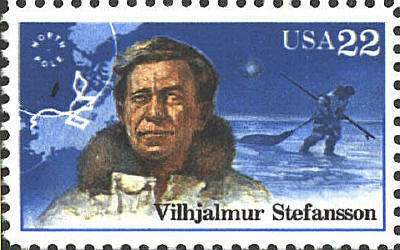 Stefansson sailed north from Alaska into the Beaufort Sea. 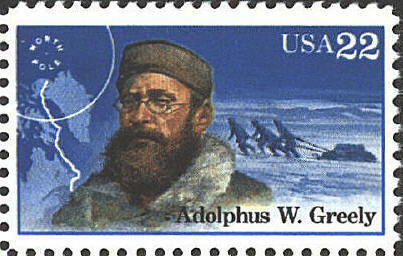 His expedition lasted from 1913 to 1918. His ship was caught in the ice and sank, and only 9 of the crew of 20 survived the 60 mile walk out. Stefansson once owned Wrangel Island which sits on a massive oil field. Possession is disputed by Russia and the United States. 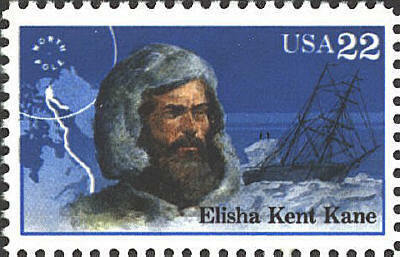 Peary led several Arctic expeditions over a 23 year period. Matthew Henson was his right hand man for 22 years. 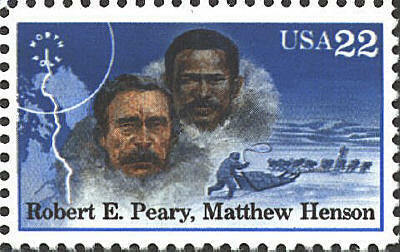 Peary and Henson reached the North Pole on April 6, 1909.